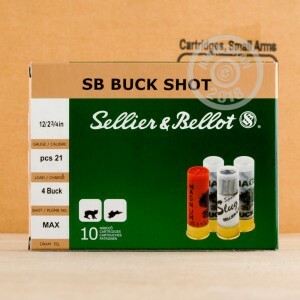 This 12 gauge ammunition from Sellier & Bellot is a great general purpose load for target practice and self-defense. 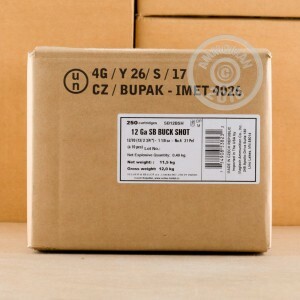 Packaged in boxes of 10 (with 25 boxes in a case), these Czech-made shells fire 21 pellets of #4 buckshot and will work great on two and four-legged assailants alike. #4 buckshot is a great choice for indoor self-defense because of its balanced penetration. 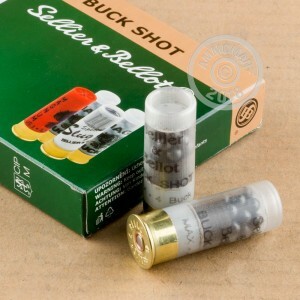 Save some serious money on buckshot at AmmoMan.com! We offer excellent case prices and free shipping on all orders over $99.